There are many methods associated with repairing hail damage on automobiles. Some of these are valid and some are simply myths. The main insurance approved hail damage repair methods are paintless dent repair and conventional repairs. Some of the other methods that have not been proven or have actually been disproven are dry ice, leaving the vehicle out in the sun, toilet plunger and the as seen on TV “Dent Pullers“. The short answer is maybe. We have never seen it done successfully. What we have learned is that the act of placing dry ice on the panel will make the metal contract rapidly. This may pop out a tiny hail dent, but it will almost certainly warp the entire panel. If a vehicle panel is warped in this way, it is ruined. Not worth the risk in our professional opinion. Toilet plunger used for auto hail repair we will not even discuss. Come on really? Auto hail repair by leaving the vehicle out in the sun is a little more interesting. The fact is that outside in the bright sunlight it is very difficult to see dents. Especially on light-colored vehicles. Gold, White, Silver and others “hide” the dents well. The dents are not physically popping out, they are just not as visible. Once the vehicle is pulled back inside and put under lights, all of the dents will still be there. Our current president of the board of the World Hail Network lives in Arizona and he assures us that the extreme heat has never removed a single dent from his wife’s car. He promises that he will get around to repairing them any day now. It’s like the shoemakers kids go barefoot. The Ding King, Pops-a-Dent, Fix-a-Dent and any other over the counter dent puller should be avoided. Many people cause more damage attempting repairs with these kits. The act of removing dents takes skill and years to learn. The kits also do not include a dent light or a knockdown which are both crucial to having a successful auto hail repair. Hail damage repair bills can be a little shocking if you are not informed. Even very minor hail damage of a few dents may end up costing over a thousand dollars. There are many factors that will affect your estimate and the repair bill. Limited access to the dents as well as their depth may make the costs climb very quickly. For example, you may only have 1 dent in the roof, but if it is too deep for glue pulling and in a bad spot, the headliner and sunroof may need to be removed and installed which can run a few hundred dollars in labor alone. 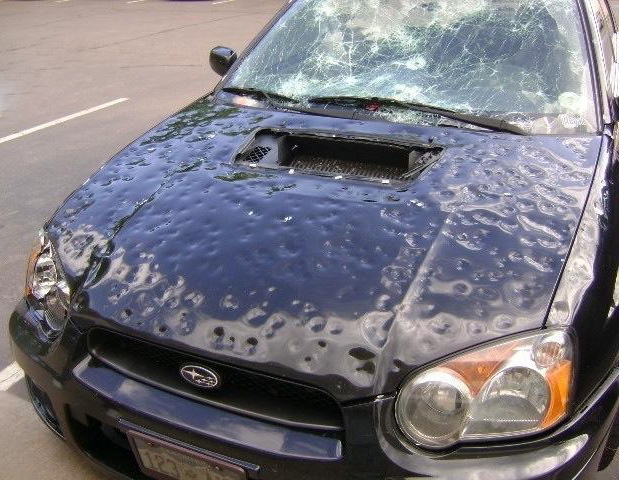 Typical costs for hail damage repairs on most vehicles will range from $500 up to $4,00 using paintless dent removal. Once the damage exceeds the $4,000 point (and often times sooner) a combo repair is required. A combo repair is when a paintless dent repair technician repairs what he / she can and then the body shop repairs or replaces the rest. Obviously, since more parts and supplies are required for the conventional repairs, the prices goes up rapidly. Combination repairs may or may not involve the push to paint process.These combo repairs generally range from $2,000 to $7,000. In extreme storm damage cases, paintless dent repair is not an option at all. Full conventional repairs can start around $2,000 and go up from there. Once a certain percentage of the value of the vehicle is reached, the car may become totaled known as a total loss.